Gutters provide specific aesthetic and functional roles that should not be overlooked in protecting one of your biggest investments. Unfortunately, most people don’t know enough about gutter selection, sizing and proper ways to divert water away from the foundation. Understanding that moisture is a home’s biggest enemy is the first step in creating a safe and structurally sound living environment. Bigger is better – opt for 6” instead of 5” – the wider the gutter, the more volume of water it can handle. They look nicer too. Hire a professional gutter installer that will measure and cut your gutters to exact measurements and will install them at the appropriate pitch for proper water management. Make sure the fascia board is intact. Replace rotted wood with vinyl, if possible, and have the installer use drip edge if not already in place to discourage wood rot. 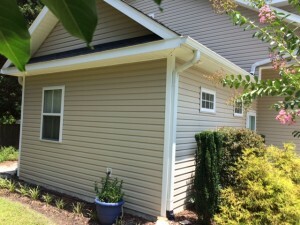 Downspouts should be properly sized and spaced to capture and transport the maximum amount of water off the roof and away from the foundation. Do not attach corrugated pipe to the downspouts and bury it in an effort to divert water away from the foundation. Corrugated pipe is easily clogged and compromised when buried. It is readily penetrated by roots and clogged by debris resulting in backwash and unintended seepage towards the foundation. If pipe must be buried, your installer may want to use Schedule 40 PVC pipe as a more robust and efficient means of diverting water away from the foundation. This pipe is strong, smooth, and keeps smaller roots out. It is a much better option for underground applications. Keep in mind that bigger roots are strong enough to break pipes and concrete. Make sure the soil around the house is sloped away from the foundation and avoid planting bushes or trees in close proximity to discourage foundation damage. Use splash blocks at downspouts, where applicable. The goal is to divert water away from the foundation. Keep a clean roof to reduce undue stress on gutters, that when clogged, can in turn accelerate deterioration of the foundation, walkways, and driveways through clogged downspouts and compromised drain pipes. Lastly, get at least two professional estimates. When in doubt, contact your local building inspector and/or an experienced licensed contractor that understands and embraces building science. Pete Hernandez is a Broker/Realtor® with the Hernandez Group at Keller Williams Pinehurst. He is a Building Performance Institute (BPI) Building Analyst and Envelope Professional with a passion for building science and hands-on experience in energy efficiency, insulation, and moisture management in residential construction. He can be reached at pete@rachelhernandezrealtor.com.